Scary Terry's World: More Batmania! The world was Batman crazy in the mid-60s, thanks to the twice-weekly television series (which I love, by the way). Ads in these Sunday comic sections I've been scanning tend to run to appliances, furniture, breakfast cereal and sugary drinks for kids. But once in a while, you get a doozy like this one! POW! 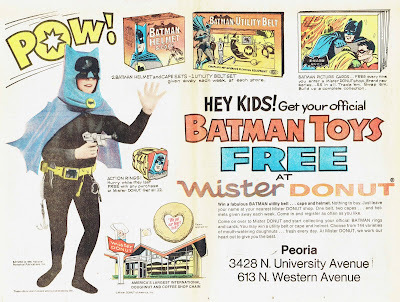 Batman toys for FREE!?! Why, oh why, was there no Mister Donut in my neighborhood!?! I had those Batman trading cards -- and wanted that helmet awfully bad -- but, alas, I had to make it through childhood without one. 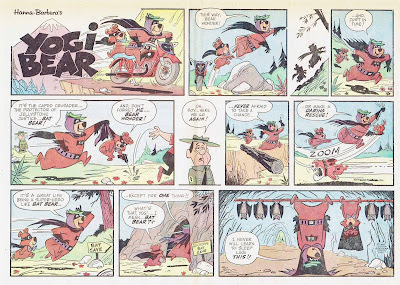 And dig this Yogi Bear strip goofing on the Batman craze. I don't know who drew this -- but there's some mighty good cartooning going on here!